Double-Alpha Academy is proud to present the new Double-Alpha Competition belt. This new Inner & Outer shooting belt offers the best features for serious competition shooters. We designed the belt to be slightly thicker than most others, so that the holsters and pouches mounted on the belt will sit firmly in place and will not rock or slide around. This makes it slightly harder to thread some makes of holsters and pouches, but all types of gear will fit. 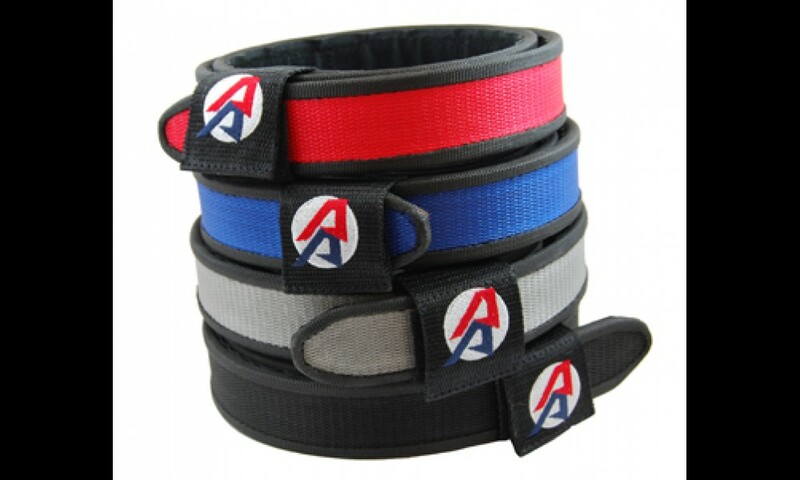 The Double-Alpha Competition Belt is available in Black, Blue or Red, with the color boldly displayed in the wide middle section of the belt, not the trims. 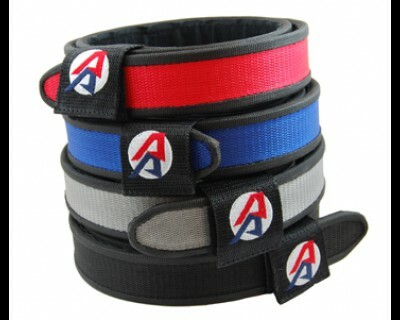 - Sizes available from 32"-50"
- Smaller sizes (32"-34") have an 18cm (7") overlap section, while larger belts (36" and up) have a 24cm (9.5") overlap section. This is to ensure the smaller size users have enough space on their belts for all their magazines pouches. 1. Measure your actual waists circumference at the height where you plan to wear your belt. 3. The total is the overall length of the belt you should order. 4. Consult the table below to select the right size for you. If you measure around your waist 86cm/33.85", you should choose a belt which is about 104-110cm/41"-43.3" Overall length, which would mean a DAA belt size 34". If you measure around your waist 98 cm, you should choose a belt which is about 115-123cm/45.25"-48.5" Overall length, which would mean a DAA belt size 36 or 38" (38" would be safer bet, a little long is always better than a little short). DAA currently offer two kind of belts, and I would like here to point out the differences between them, and give you the information you need to choose the DAA belt which best suites your need. The DAA Competition Belt has been our IPSC belt since 2009. It has become hugely popular and appreciated by shooters around the world due to its extreme stiffness. This belt is VERY firm, which is, arguably, the most important feature of an IPSC belt. It is an excellent choice for those looking primary for performance. However, some shooters, especially those with smaller waist circumferences may find it to be too stiff. Some have said they find it does not fold enough to folow the contour of their body as well as they would like. Additionally, in order to achieve this increased stiffness, we made this belt slightly thicker and slightly wider than most other manufacturers of inner/outer 1.5" belts. This means that fitting other manufacturer's gear, which may need to slide onto the belt, such as CR Speed, can be very difficult. It can be done, but it is a struggle. This is no concern if you plan to use DAA holsters and pouches, as they do not slide on, but are assembled in place. The newer DAA PRO Belt is designed for improved finish and appearance. The webbing used and overall apperance is more luxurious. It includes a rubberized (not embroidered) safety loop logo, a DAA logo on the inside of the inner belt webbing, and the cool new feature of a name-card holder built into the outer belt. With this, should you forget your rig on the range, it can be returned to you. The DAA PRO Belt is very slightly thinner and narrower than our Competition belt. It is more in line with the dimentions used by other 1.5" belt manufacturer, and so it is much easier to slide on gear from other manufacturers. And while it is still a rigid belt, it is not quite as rigid as our Competition belt. Some users will prefer this, for a more comfortable fit to their body. For comparison, it is probably jsut a hair more rigid than the CR Speed Belt. So in summary, those looking for the absolutely most rigid belt available, to make sure their mags and holster are rock solid as they run on the stage, and they plan to use the DAA holster and pouches (an excellent choice!) should look no further than the lond standing DAA Competition Belt. However those looking for a sleeker more luxurious looking belt, preferring perhaps a little more flex in the belt for a more comfortable fit, and/or planning to use gear from other manufacturers, may well find the DAA PRO Belt better suites to their needs. * Note that both belts share the same sizing chart and lengths.